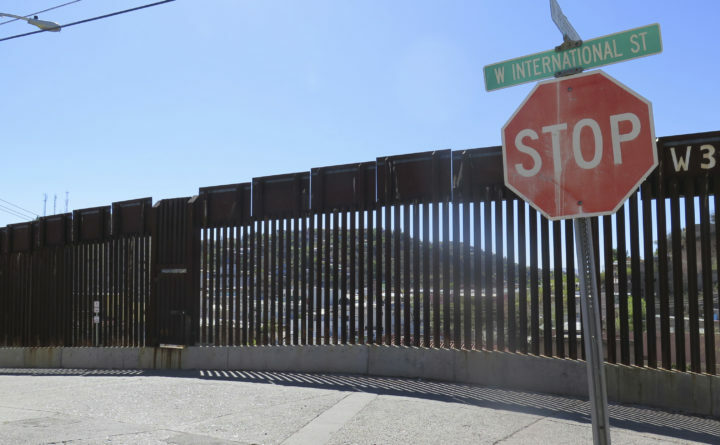 A stop sign is seen in front of the international border fence in Nogales, Arizona, March 9, 2016. WASHINGTON — A groundbreaking Obamacare case from 2015 could provide the legal underpinnings House Democrats need to sue President Donald Trump if he moves forward with building a border wall. It was in House v. Burwell that a federal judge said — for the first time — that Congress may sue the executive branch over spending money it hasn’t appropriated. That case had to do with health insurance subsidies, and was brought against the Obama administration by the House when Republicans controlled it. The lawsuit ultimately ended in a settlement after Trump took office. That ruling probably has opened the door to a lawsuit from the now Democratic-led House if Trump follows through on his threats to declare a national emergency and start building a border wall without congressional consent. And that remains a distinct possibility: Negotiations to reopen the government remained stalled over the weekend and the president appeared to dig in to his position, despite urging from even Sen. Lindsey Graham, R-South Carolina, to cut a deal with Democrats. “With Trump determined to deliver on his signature campaign promise of building a border wall and Democrats standing firm against what they view as an immoral and ineffective solution to illegal immigration, there is no end in sight to the dysfunction,” Washington Post reporters Bob Costa, Josh Dawsey, Philip Rucker and Seung Min Kim wrote. That’s exactly the contention House Republicans made about the Obama administration when they argued that then-Health and Human Services Secretary Sylvia Mathews Burwell was using dollars unappropriated by Congress to fund what are known as “cost-sharing reductions,” or CSRs. That money was provided under the Affordable Care Act as a way of helping the lowest-income Obamacare customers finance extra costs associated with their health plans beyond the monthly premium, such as deductibles or copays. “I believe the House has legislative standing in this matter but that does not mean they have a good case to bring,” Jonathan Turley wrote in an email over the weekend.